Writing about the film from the Sundance Film Festival, Karina Longworth mused on how, in a film starring more-or-less well known (and in one case, Oscar-winning!) actors, "the classic Duplass anticipatory zooms take on a whole new level of invasive creepiness." Now the veracity/value of this statement rests in whether or not you buy the idea that the zooms that "Cyrus" is replete with are genuinely "anticipatory." I don't think they are. What I saw in the film were a lot of perfectly serviceable/banal medium shots and medium closeups that were almost constantly interrupted by a sudden, jerky, lunging-forward in perspective. One second, you're looking at John C. Reilly's face as he's saying something; the next, you're looking at his eyebrow, and contemplating just how little hair it has on it, and wondering why that is. The effect, frankly, was rather like taking a sizable slug of high-proof liquor, and having it come directly back up from your stomach, and just being able to catch it all in your mouth before you projectile-vomited it. (I allow that this is a somewhat specialized analogy.) Hence, I cannot say that I found myself even a bit on board with Longworth's later defense: "You could say that 'Cyrus' looks ugly, but that ugliness is an artifact of a working method." What "working method" is meant here? The method of drinking a shitload of coffee before you pick up your video camera, so that your thumb hits the zoom toggle on the handle at pretty much any goddamn time? Because if you tally up the number of zooms in this picture, and examine the contexts in which they manifest themselves, it becomes pretty clear that they really have no compelling reason for being. Here is an instance of a critical defense in which some specificity would have been mighty welcome. The debate over this issue has extended to Twitter, wherein the aforementioned Richard Brody protests the Self Styled Siren's complaints about the film's "unmotivated zooms" by way of making a few snide asides about cinephiles who love old Hollywood (because the Siren loves Old Hollywood, you see), and citing precedents that I don't see as particularly apropos, e.g., "Tag Gallagher tells excellent story of Rossellini inventing remote-control zoom. See 'Rise of Louis XIV'--lots of zooms there." And indeed, there are lots of zooms in Rossellini's film, and many of his others, and they vary as much from the zooms in "Cyrus" as they do, say, from Jess Franco's zooms into Lina Romay's pubic area in 1973's "Female Vampire" (a fabulous film in oh so many respects!) or Hong Sang-Soo's largely ineffectual zooms in 2005's "Tale of Cinema" or, for that matter, Hong Sang-Soo's more carefully deployed zooms in 2008's "Night and Day." To object to the hallmark of "Cyrus"' visual one-hesitates-to-call-it-style does not, I insist, make one a fetishist for Old-Hollywood style cinematic "neatness," nor does it make one a Jeremiah-Prokosch style philistine. Yes, Richard, zooms represent a filmmaker's choice. In "Cyrus" the zooms are chosen in a way that alienates the viewer with no appreciable aesthetic payoff. I'm not saying this to be a jerkoff; I am genuinely curious as to what Brody thinks the value of these shots are, and what they "mean," besides being expressions of a filmmaker's choice. Here's Chris Fujiwara, in a wonderful piece, "Zooming Through Space" (http://www.hermenaut.com/a18.shtml): "Camera movement is concrete and explores physical space; the zoom is abstract and has to do with a psychologized, relational space that opens up or shuts down." The zooms in "Cyrus" provoke a sense of intimacy and tension, of nervousness and isolation. They're motivated by the directors' sense of mood, their emotional relationships to characters and scenes. The zooms reflect the filmmakers' distinctive feeling for the events they depict, for the texture of life. Which is to say, by their desire to see and to show things a certain way--and that desire is the essence of the cinema. And thankfully the filmmakers didn't have producers who walk around with little rule books in their pockets and ask them what the motivation for their zooms might be. Thinking about movies as closed-off dramas is indeed part of the problem. There is a modern cinema, and there is an ambient classicism--the downside of cinephilia--that resists it. Although I fail to see how the zoom lens, a staple of '60s television and movies, can be considered a hallmark of "modern cinema" itself (in opposition to "ambient classicism," yet), I recommend the entire discussion. JE: Having watched this clip -- which shamelessly overuses the infamous "24" push-in/pop-out zoom I have discussed previously, creating a sense of finicky distraction that shifts your attention from what's in front of the lens to what's behind it, for whatever reason that might be -- I would like to smack the directors over the head with a very long zoom lens. But the scene itself indicates the (brain) damage has already been done. This is just embarrassing. Having not seen "Cyrus" yet, I was only able to, at best, kind of see what he was talking about. Also, not having seen "Cyrus" yet, I was most unwilling to talk about it here at all, because, well, what do I know about it? Then, over the weekend, I was watching "At the Movies," and saw Michael Phillips and A. O. Scott's review of the film. Scott based his entire negative response to "Cyrus" on those zooms, and showed a clip of "Cyrus" to illustrate his point, prefacing the clip by asking Phillips, and the viewer, why the camera was doing what it was doing. 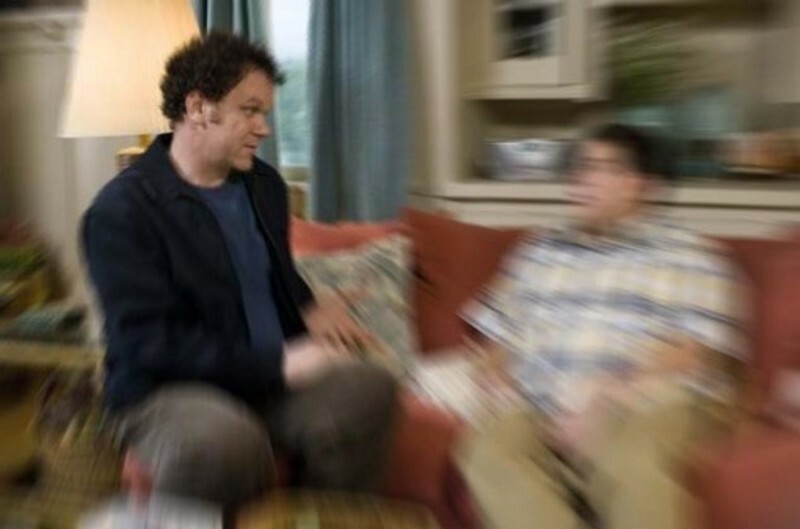 What the camera was doing was, in fact, zooming in arbitrarily on John C. Reilly, and then pulling back suddenly, or, when Marisa Tomei enters the scene, zooming in on her. In the case of the Tomei zoom, you might say that, well, she just got there, and the camera wants to isolate her. Which would be fine, if she wasn't already, not only center-frame, but the only thing in the frame at all that you might want, or feel compelled, to look at.